It has been almost a week since the mountain above Vernazza came crashing down upon this picturesque village. Tuesday, October 25, started as most mornings do, with errands and preparation for the lunch hour. The first of the rainy season’s storms was pouring down rain as usual for a late October day. The town’s people were about their business, going to the bank at the top of the hill, having caffé at the Blue Marlin Bar and my father-in-law was setting up for a long day of work remodeling a building on the mountain side. Everything seemed normal, but the rain was coming down so hard, the street had turned into a rushing stream. My father-in-law and the other workers had problems operating their equipment in such heavy rain, so they wisely decided to call it a day and head home. The rain kept pouring down until the village became a rushing river. The cars in the parking lot above town began to get swept up by the water. The strong current carried cars and trucks down into town like they were nothing but toys. Some locals looked on from their balconies with disbelief as their cars rushed by below them. And the rain kept coming down…until the unthinkable happened. Around 3pm, the mountain above gave way and like a dirt tsunami, the earth plowed down, sweeping up everything in its path, pushing around the corner in a rush of flowing water, rocks, mud and cars. Smashing into the walls as the road turns and bottlenecks, a house collapsed from the pressure. The flow instantly eliminated the children’s playground before smashing into the bridge of the train station, burying the tracks and filling the second story tunnels with debris. The concrete and iron was no match for the fury of the landslide. It continued on, barreling down Via Roma, engulfing every business along the way, sparing nothing and no one. Some people had to flee to avoid getting carried away; many made it to safety—some did not. Some saw their loved ones swept away before their very eyes. The raging landslide continued on, destroying what was left of this UNESCO World Heritage Site. The monstrous earth poured into the piazza like a wild animal set loose and dumped all the cars, dirt, debris and boats into the sea. Everything on the ground floor, from the top of the mountain to the end of the piazza is destroyed. The debris filled the narrow street of the village up to the second floor, burying the ground floor as if it never existed. With all the doors buried below 9-10 feet of debris, people needed to climb out of their windows and balconies to get out. All roads in and out of Vernazza were washed away, the train tracks buried and people were left with no water, no gas, no electricity and no cell service. The outside world had no news, no contact, no information at all. In a terrifying wave of destruction, Vernazza had been completely severed from the rest of the world. 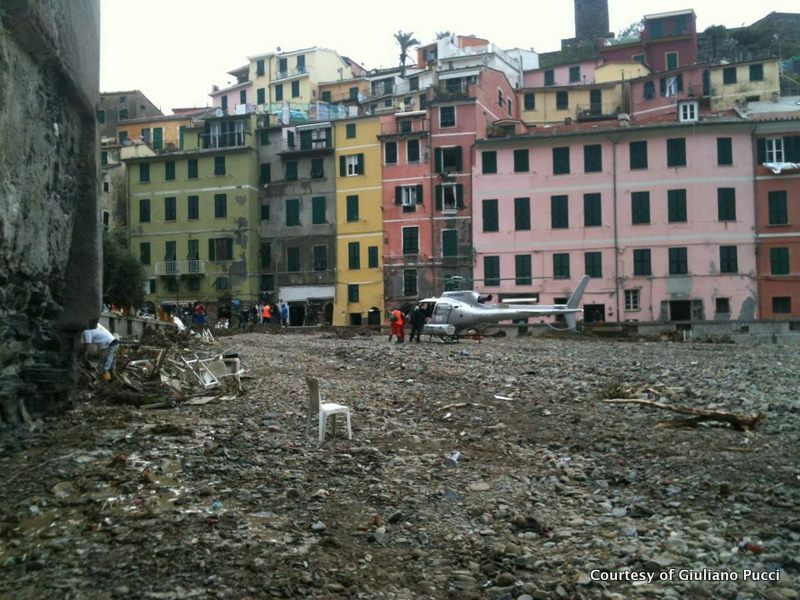 The following day, news slowly seeped into La Spezia, the nearby city, as a few survivors arrived by boat. Those of us with friends and family in Vernazza were aware that the storm had caused terrible damage, but we had no idea of the scope of devastation. Emergente boats were sent with first-aid supplies and drinking water. As word got out, volunteers started coming with boots, shovels and plenty of cigarettes. By Friday, the Protezione Civile (Italy's version of a National Guard) started an organized response with registered volunteers, earth-moving equipment and rescue helicopters. For days and nights people have been working non-stop to dig Vernazza out of the rubble. My heart was crushed to think about what my friends in Vernazza were going through and to see the images and hear the stories made it that much more devastating. As of now, there are still four people missing. But from the depths of despair for a treasure lost to destruction, rays of hope begin to shine through. Only 120 hours after the landslide, the river that had reclaimed it’s original route through town has been redirected, the ground is now visible in the piazza and the rail lines are getting cleared. Firefighters, civil protection, the Red Cross and countless volunteers have joined the locals in the rescue effort. My husband joined them this weekend helping to clear the debris, and even though he says it will take years to bring Vernazza back to it’s glory, I feel hopeful and positive for a bright future. Messages of support and love have poured in from all over the world. Facebook has been a great way for people to share information, photos and support. It has also been the only means of detailed information due to almost zero news coverage on Vernazza. Those of us on the outside have been able to stay updated thanks to people on the ground like Giuliano Pucci, who took these photos, and Facebook groups like Diamo una mano a ripulire Vernazza and Riomaggiorese Nel Mondo. 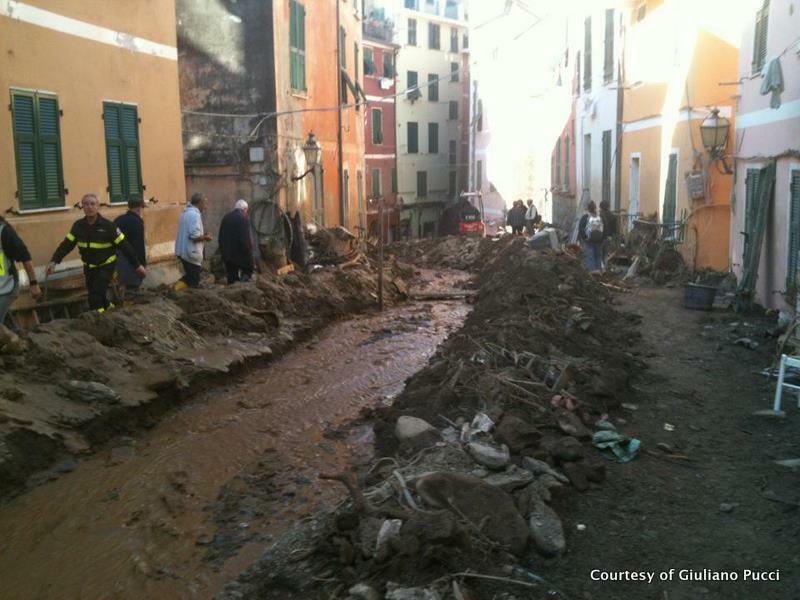 Of the five villages, only Vernazza and Monterosso have sustained damages. Corniglia, Manarola and Riomaggiore are fine. 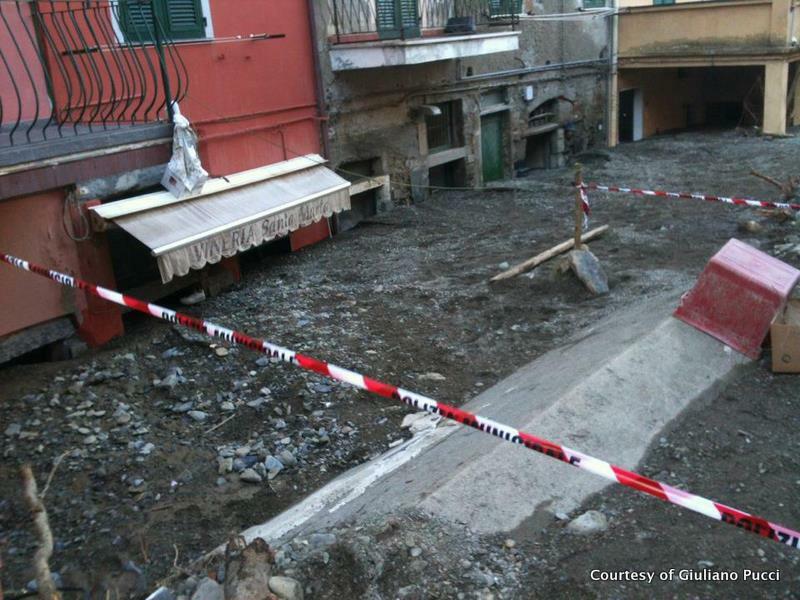 There were also several other towns with massive damage and flooding throughout Liguria and western Tuscany. Towns like Brugnato and Aulla, which are located along the flooded Magra river, were nearly destroyed and left without electricity, gas and water. They each have their own rescue efforts in full swing. Vernazza has made a place in people’s hearts all over the planet and many have been asking how they can help. If you would like to donate money to help the victims and the rebuilding of Vernazza and Monterosso, a fund has been set up by the Municipality of Monterosso at their official bank, Carispezia of Levanto. *Please make a note on your transfer: “Help for Monterosso and Vernazza”. There has been many requests for donating specifically to Vernazza, and a new non-profit organization has been set-up by the City of Vernazza called "Per Vernazza Futura"
But The most important thing you can do to help is to support the CinqueTerre with your business. The shops and restaurants are destroyed for the time being, but all the rooms are located well above any damage and should be unscathed. Vernazza should be open for business next season, so come back and visit soon and tell everyone you know to visit! Sunday afternoon the workers were rewarded with a hot lunch all together in their piazza. Spirits are up and there is such a strong comradery to bring Vernazza back. The best thing they have though, is the amazing Italian heart and soul of the people and the generous outpouring of love and support to keep them going strong. Vernazza will come back from this and continue to win the hearts of new generations to come. FORZA RAGAZZI!! !